One of the few perks that comes with being the channel manager of Patheos Pagan is that I get copious amounts of review copies from various publishers. 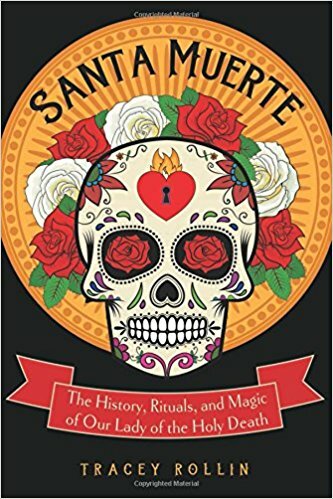 Generally I pass those books to other authors here, but when I saw Tracy Rollin’s Santa Muerte: The History, Rituals, and Magic of Our Lady of the Ho... arrive I knew I’d be keeping that one for myself. What I didn’t know at the time was how much I’d like it! 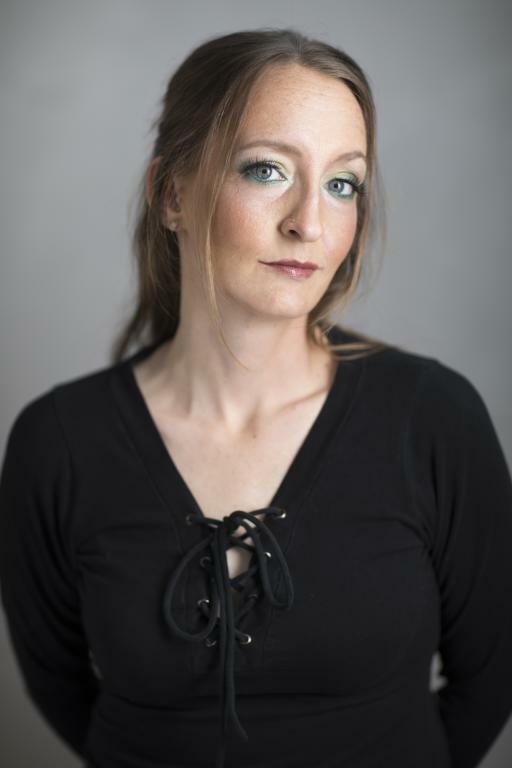 Tracy’s book is fantastic (review below) and after reading it she was kind enough to answer some questions about her book, her practice, and Santa Muerte. Let me also add that this evolved into something more than an interview, Tracy went above and beyond answering my questions. Jason: Let me just start by saying I LOVED your book so much. Just fantastic. I guess the best place to begin with our interview is to ask how you found Santa Muerte? Was there a big “a ha!” moment or was it a more gradual type of thing? Tracy Rollin: Like many people, I grew up feeling apprehensive and uncomfortable around the idea of death. The first funeral I attended when I was a child was for a friend of the family. I remember being terrified that the decedent would get up out of his casket and shamble about the room. When considering my long-term spiritual goals, it occurred to me that studying the cycles of decay, change, and renewal for necessary for forming a complete picture. I believe in reincarnation towards eventual perfection, and reincarnating requires that you die first. I spent several years studying ideas about death and dying before encountering Santa Muerte. My encounter was a chance one – I just happened to be at the grocery store, which sold a large quantity of saints’ candles, Lucky Lotto candles, and other such things. I happened to glance down and see an entire shelf of candles dedicated to a friendly-looking lady skeleton named Santa Muerte, a saint whom I’d never heard of, but she had more shelf space than the Virgin Mary and Jesus combined! I bought a candle and took it home. Using the usual methods Catholics use to petition a saint (I myself was raised Catholic) I called upon Santa Muerte to reveal herself to me. I didn’t really expect anything to happen – I had no relationship with her at all, and I am not a practicing Catholic anymore anyways. Just a few days after I did this, a friend of mine showed up at my house. She’s the sort of person who loves picking through rummage sales, and she found a box of Halloween stuff that she thought I’d love. Underneath all of the cheap rubber bats and spiders I found a Santa Muerte statue, the first I’d ever seen – and several newsprint prayer guides as well. It seemed pretty clear at that point that Our Lady of Death was inviting me to work with her. That was nearly a decade ago now. Twenty years ago Santa Muerte was virtually unknown outside of Mexico, and even then people were rather quiet about worshipping her. Why has her popularity increased so quickly over the past couple of years? How popular do you think she’ll get? It is absolutely true that Santa Muerte has exploded in popularity in the past twenty years or so. In fact, Santa Muerte is thought to be the face of the fastest-growing new religious movement in the world today. Knowledge of her has certainly been driven by increased immigration from Mexico – I am blessed to live in New Mexico myself, just a few hours from the southern border, so she is deeply embedded within the culture here. In fact, Santa Muerte is becoming a world-wide phenomenon. A friend of mine was visiting Turkey a few years ago, and he was kind enough to purchase for me some Santa Muerte items he found in a market there! I believe there is another, larger reason why Santa Muerte is becoming so popular in particular, when there are a lot of folk saints that are well-known in Mexico but are not gaining the same traction here. Santa Muerte represents a feminine form of the power of death. Commonly people associate female energy with birth, growth, life and renewal – fertile mother goddesses abound, after all. However, it’s not commonly recognized that life and death are intrinsically linked. Spring animals are raised for fall slaughter, grain must be reaped, and giving birth can also easily be fatal; for millennia, childbirth has been a leading cause of death for women, and it continues to be a dangerous and deadly prospect for women in less developed countries today. Santa Muerte represents the feminine power of death in that it is a force for positive change, growth, and renewal – by reaping and burning the fall fields, the spring planting will be made so much richer. This is an extremely attractive concept in our modern era. There are a lot of awful things going on in the world today, and many of us just want an end to the pain, suffering and confusion. The death of our fears and suffering in order to plant a new and brighter future is just what we want – and is the power that Santa Muerte represents. Santa Muerte is thought to have around ten to twelve million devotees in the world today. By means of comparison, the Church of Latter-Day Saints, or Mormons, counts around 15.8 million members. There really are nearly as many devotees of Santa Muerte as there are Mormons – she’s already that popular. I predict the number of Santa Muerte devotees to at least double in the next twenty years or so. Santa Muerte is honored primarily as a Catholic folk saint, but she’s showing up with increasing frequency outside of that context. What advice do you have for any Witches or Pagans who want (or are feeling called) to work with her? Do it! Death is a universal experience, and so Santa Muerte is likewise a universal saint. The power of death has always been recognized as an egalitarian one; it knocks equally at the gates of kings as it does at the doors of the poor. Any person is qualified or eligible to work with her for this simple reason alone. Santa Muerte accepts everyone. Don’t let her Catholic presentation throw you off. It’s already not unusual for Catholic icons to have deeply pagan roots. Even the Virgin Mary is thought by many to be a modern form the Egyptian goddess, Isis. Santa Muerte is thought to be rooted in indigenous Aztec beliefs, pre-Christian Western ideas, and with perhaps even some African concepts thrown in as well. 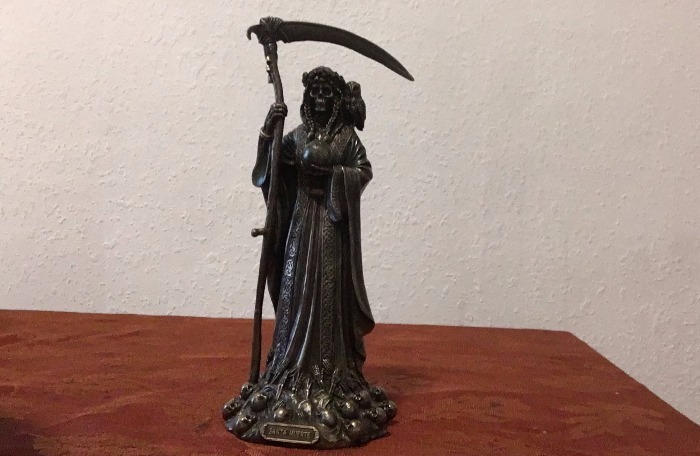 Because of the wide number of ideas that influence Santa Muerte’s modern idea, it’s easy to find a more personal connection to this saint without relying upon Catholic beliefs. In fact, that’s the core idea of my book; how to effectively adapt traditional Catholic practices to more pagan-friendly ones. I can’t remember the last time I sat down and read a Pagan book cover to cover in two days. Rollin’s prose is sharp, never boring, and expertly mixes practical advice for working with Santa Muerte along with personal experiences. There have been a few other books released about Santa Muerte the last couple of years, I think this is THE book on the subject. While Rollin opens the worship of Santa Muerte to anyone, she also keeps the Catholic folk-saint grounded in traditional practices. Honoring and performing magick with Santa Muerte through a rosary consecrated in her name just made sense to me (and has been added to my own practices). And as someone who didn’t grow up Catholic I like that Rollin took the time to thoroughly explain the hows and whys of such practices. If I have one quibble with this book it’s the lack of footnotes. The history in the book is solid, but footnotes would have made it even more so. (Something tells me this is a publisher decision, and not one by the author.) If you have even just a little bit of interest in Santa Muerte this is the place to start. There are seven powers (or colors) traditionally associated with Santa Muerte, can you talk a little bit about those and how they work in relation to her? Simply put, you call upon the aspect that pertains to the question or problem at hand. For example, If you’re about to head out to the casino with your friends, saying a prayer to or casting a spell involving the gold aspect of Santa Muerte that governs luck and gambling is a good idea. It is traditional to offer Santa Muerte some kind of thanks in return for her aid. If you score five hundred bucks playing poker, you owe her a little treat like a bottle of tequila or some really tasty chocolate. Since you will ultimately consume these things on her behalf at the altar, it’s a win for everyone. Some problems do require the interaction of multiple aspects of Santa Muerte. Someone going through a nasty divorce, for instance, would call upon the blue aspect to rescue social relationships like mutual friends that are suffering because of the enmity between spouses. They would also call upon the green aspect to help them with the legal aspects of the divorce. In your book you call Santa Muerte a jealous goddess, going so far as to suggest that she doesn’t play well with most other deities. Can you elaborate on this a little bit and suggest some things to stay on her good side? It is absolutely true that Santa Muerte is a jealous spirit in that she does not like sharing space with other spirits, with just a few rare exceptions. The most common altar mate to find with Santa Muerte is Saint Jude, who is an official Catholic saint who is the patron of lost causes. Since calling upon Death is a desperate measure from a Catholic perspective, he and Santa Muerte tolerate each other just fine. Saint Cyprian of Antioch, who is the patron saint of occultism (yes, the Catholics actually have one) also works well with Santa Muerte since they both accept witchcraft and magic just fine. There are a few other folk saints, such as Jesus Malverde, who is thought by some to be Santa Muerte’s own son, who make fine altar mates for her as well. This fact stems from the dominant power that Santa Muerte represents, one that is well supported by her mythology. In ancient Europe, the ultimate power of death is often a reaper-type of female figure. The figure that holds this power often has incredible dominion over other deities and realms of the earth. One such example is the final of the three Greek Fates, Atropos, who cut the thread of life with her scissors. Her power and capacity to enact her judgment were so great that not even Zeus, the king of the gods, could sway her mind or overrule her. In Norse myth, it is believed that the next age of man after Ragnarok will be ruled by Baldr, who will become king of the gods in place of Odin. Baldr however was slain by the trickster god Loki’s indirect hand, and so he was forced to wait for the next age in the realm of the goddess of death, Hel, as one of her charges. This idea that great power of Mother Death held dominion over all was also echoed in Aztec mythology. When each person died, they would travel deep into the underworld to await their rebirth into the next age of history within the cold stony womb of their own death goddess, Mictecacihuatl. Even the other gods were forced to steal the souls of the dead away from her when they decided to start this age of man without her august consent. To be fair, the goddess of death was sleeping at the time. All of these ideas and stories are incorporated into the modern form of Santa Muerte, and so Santa Muerte is often regarded as an equally strong and dominating figure. Placing her in a position that does not recognize this relationship relative to other divine powers, such as in a cluster of other gods upon an altar, is frequently viewed as an insult, or at least a denigration of her power and authority. Other spiritual powers on the altar may not like sharing space with Santa Muerte, either – such as the majority of Catholic saints. What will happen if you mix and match anyway? The most common result is simply nothing, no matter how much you pray, beg, promise, cajole or threaten her. After all, if you won’t recognize that she’s ancient, wise, powerful, and deserving of at least her own little corner, why should she respond to you? If you have developed a strong relationship with her and proceed with this, often you will experience a strong negative reaction of some kind. Insulting your friends has its consequences. The easiest way to avoid any sort of trouble is to simply give her a spot to call her own. Fortunately, this doesn’t have to be big at all – I’ve seen effective working altars that would fit onto a paper plate. Portable altars, like those made out of cigar boxes, also work really well. In your book you write about Santa Muerte being possibly related to the Aztec goddess Mictecacihuatl, and also possibly Azrael the angel of death and Spain’s Grim Reapress. Where do you think her origins lie? Or is she perhaps a combination of several different forces? I personally believe that we create our own gods by putting names and faces on what are otherwise universal forces. By the same natural and great interaction between our consciousness and reality that makes magic possible, our collected desires bring gods into their own. These deep desires – sometimes so deep we may not be actively aware of them – shape that call unto the divine. For example, if our crops are withering in a drought, we will quickly find a storm god up in the heavens to whom we will pray for rain. As belief in a particular deity fades, so does their influence. Our deeply-held desires call forth a face of a certain universal need or power, and our beliefs and customs dress it. We carry forward the ideas of our ancestors and learn those of whom we meet. Santa Muerte represents the power of death and the change that it brings, but her character is not inherently frightening, dreadful, or evil. In fact, the face that she presents is quite a friendly one. How could the power of Death be friendly? Death has no need to apply its power aggressively, since death and change are an eventual guarantee for all. There’s simply no reason for it to rush. Furthermore, death is a necessary step on your Great Big Adventure, whether you believe in reincarnation or some kind of eternal reward. As such, how can Death be anything but friendly and helpful? Santa Muerte embodies this idea of a friendly and patient Death. We carry forward the beliefs of our ancestors and adopt those of whom with which we frequently interact. These beliefs help dress the deities whom we have called into power, giving them often a very specific face. Santa Muerte’s distinct characteristics arise from the blended beliefs of three different continents. I believe this lends credence to my idea that we call into form specific forms of gods and spirits in order to deal with certain universal powers and desires. We then give them the shape that we need them to have. Therefore, why would we want a powerful, friendly female Grim Reaper in our lives? The idea of a feminine Death brings with it the idea of renewal and rebirth. This is incredibly appealing in our modern times so full of crime, disease, poverty, warfare, and social unrest. A sudden and powerful stop to all of these things in order to create a beautiful and bright future is what so many people want. We don’t want the death of ourselves, or of others. We want the “death” of ugliness, hatred, and hopeless situations. Choosing Santa Muerte as the face of this desire means choosing a friendly and loving lady that beckons us towards the future with her open skeletal hands. As someone who grew up as a Methodist I find a lot of traditional Catholic practices pertaining to the saints surprising. Perhaps most surprising to me is the idea of “saint shaming,” something I wasn’t familiar with until reading your book. Is this a practice you advise? Have you ever saint shamed Santa Muerte? The practice of saint shaming, or punishing the icons of saints that misbehave, is actually a very Catholic habit. Even monks and nuns routinely and officially practiced it for centuries until the Church finally outlawed it in 1273. Despite this, it is still a very common folk practice among Catholics. I was even taught how to perform some “shaming rituals,” if you would, by the same nuns that taught my religious classes. Shaming practices are typically mild, such as turning a statue towards a corner or covering it with a cloth, but can be as extreme as covering it in dung or throwing it outside to sit by the trash can in disgrace. The most common method of “shaming” Santa Muerte into action is by stealing her scythe away from her. This is thought to deeply annoy Our Lady of Death and cause her to act – ideally how you want her to! Some people balk at the idea of mistreating the icons of spirits, as these objects are the definition of sacred. However, I believe that humans have a lot more influence at the divine dinner table than we realize; the gods and spirits depend on us as often as we depend upon them. Building a good and strong relationship is essential to bring the deity’s power to bear to aid you. Making them your friend is actually the idea. Think of it this way: a person I barely know probably won’t loan me five dollars, and certainly not five hundred. My best friend whom I have invested a lot of time and personal energy on, however, would be glad to loan me five hundred dollars and possibly a lot more. Yet if that same best friend failed me in my hour of need, would I not be upset and wish to express my dismay? Saint shaming is rooted in this very concept – it’s how some express their frustrations. When things don’t work – usually when not at all – and my troubleshooting doesn’t point at another problem, I will vent at Santa Muerte, yelling like an angry fishwife. If I need resolution quickly, I’ve burned cheap incense on her altar, the kind the gives you a bad headache. What happens afterwards is either my problem is resolved, and so I stop being mad at her for she has apologized in her own way, or the real reason my desires didn’t manifest becomes abundantly clear – at which point I apologize to her for being so mean. Friendships are like that sometimes. Like any friendship though, if you abuse it, it will disappear. Don’t be a jerk for being a jerk’s sake. There’s a lot of information in the book about building an altar for specifically for Santa Muerte. For a lot of Pagans an altar dedicated specifically to one deity is probably a new thing. Why do you think this is important and what’s the best way to go about assembling an altar for her? Altar creation is an important and powerful magical act. It establishes a sense of the sacred, that which is set apart for a special purpose. A sense of the sacred is what transforms a regular building into a church, or an old scratched butter knife into a magical dagger. It’s also why it feels just so wrong to make a peanut butter and jelly sandwich with your athame. Assembling and empowering a magical altar creates that same sense of the sacred that is common to temples, and allows a person to slip into the role of magician or high priest. A church is just a building, after all, and the pastor is an ordinary person until they don their clerical garb. A Santa Muerte statue simply placed on a shelf does not have the same psychic weight of one that is placed in a spot that is specially washed, perfumed, and consecrated in her name by the magician’s own will. Working with Santa Muerte can be viewed in shamanic terms – she is considered to be present at all times in the place of her icon (some even go as far as to say the object actually gains its own soul, once claimed by a spirit.) After placing her icon on the altar (usually a statue) the statue is treated as if it is alive, and as if Santa Muerte is actually standing there. This is why practitioners often “play-act” with their statues, holding cigarettes to the mouth to let Santa Muerte smoke, rubbing coffee and tequila on the mouth to assist with drinking, and apologizing if you accidentally bump into her statue. These two ideas are very powerful when used together. You have created a sacred space where miracles can occur, and you call the great power of Death to literally reside there in friendship. By doing these two things together, you also transform yourself from just a person standing in front of a bookshelf to a magician officiating a temple ritual. This helps lay the foundation of an effective ritual mindset – ordinary people may not be capable of magic and interacting with the gods, but a magician certainly can. This is why altar creation is so important. If you’re going to invite a new friend to come live in your house, you’re going to give them a spot to call their own – a bedroom, perhaps, or at least sovereign rights to the couch. As discussed in question #5, Santa Muerte both deserves and expects her own spot. Fortunately, this doesn’t have to be a big or elaborate space. My first Santa Muerte altar was a statue of her I balanced on top of a shoe box into which I put ritual items and small offerings like money and candy. I put a tea light candle and a shot glass full of water on top of the box, and wrapped the base with a silk scarf I bought at a thrift store for a dollar. I put this entire arrangement on the edge of a bookshelf that I first dusted, wiped with salt water, and then bathed in sage and palo santo incense. After that, I made a point of saying hello to her every day and refreshing her candle and her water. It’s really that easy – and since it is so basic, it can be elaborated upon in accordance to the magician’s needs and the magician’s tastes. For example, some folks don’t feel that an altar is set up correctly unless elemental correspondences are placed upon it. If that’s how you do your magic, have at it – this kind of personalization is 100% okay, so long as you let Santa Muerte have her own spot that she doesn’t have to share with other spirits. What misconceptions about Santa Muerte do you encounter most frequently? Is there any particular misconception that bothers you more than others? By far and large the most common misperception about Santa Muerte is that she is an evil and destructive force. There are several reasons for this. First, the Catholic Church’s influence is extremely strong in Mexican culture. The Church is hostile to Santa Muerte in particular, despite that it tolerates the cults of other folk saints often with equanimity. Santa Muerte devotees often practice witchcraft, which the Church views as Satanic, and she welcomes rejected social groups such as criminals and the LGBT community with open arms. Because she accepts individuals such as criminals and her influence is so powerful, she has become strongly associated with violent drug trafficking cartels. This has darkened her reputation considerably. This is the misperception that bothers me the most. As discussed previously, the power of Death is a helpful and necessary one, especially these days. The fact that it comes to us in the convivial form of Santa Muerte is a blessing. Many of the devotees of Santa Muerte that I have met are warm and wise grandmothers raising their own grandchildren, dedicated hospice workers and hard-working day laborers, police officers and tradesmen. I have also met many people with checkered histories whose own brush with Death led them into the veneration of Santa Muerte, and a new appreciation for each day that led them off of their dangerous paths. I run a Facebook page called Lovely Mother Death, with over sixty-five thousand followers. I am sent prayers all the time – and you know what people are praying for? Protection for their families, help for their children in school, assistance in fixing a marriage or finding a new job. These are regular people with real problems. To call all these hard-working, big-hearted, and often struggling folks bad for calling upon Death for help hurts me deeply. Who else can you turn to when you’re at the end of your rope and all other prayers have gone unanswered? There are a few other perceptions about Santa Muerte that do not match my years of experience working with her. A common one is that calling upon her is a particularly destructive act because she will create the change you want by causing great harm, often by killing someone close to you. This simply isn’t true, or else her twelve million devotees worldwide would have called forth a great sweeping wave of death and destruction by now – and whatever the ills of the world are, I doubt it has to do the collected heartfelt prayers of grandmothers for their families. Another common misperception is that Santa Muerte requires blood sacrifice. My experience with blood sacrifice and Santa Muerte stops at accidentally nicking myself opening packages of candles – you certainly don’t need to harm any other living being whatsoever to get Santa Muerte to work for you! You end the book by saying that it’s a “thank you” to Santa Muerte. Was the book something you promised her you would write? How did the project evolve and come about? I am afraid I can’t be entirely forthcoming thanks to several initiatory oaths that I have taken. I am free to discuss things in general terms, however. Consider first that I am a reincarnationist. Given that, what is the point of all of this living and dying and reincarnating, over and over again? An answer I frequently hear is that we are all working towards some form of spiritual perfection, and that this world is a classroom in which we learn our lessons. Sometimes I hear that this world is a prison for consciousness created by cruel and uncaring forces, and that our purpose is to figure out how to escape. Suppose that either idea is true. What happens when you finally score 100% on all of your exams and graduate, or when you finally slip the warden and his guards? Then what? In other words, what happens when you finally win the reincarnation scenario? This question sometimes makes people uncomfortable. I’ve even been told that there is no winning this game, and we are due to reincarnate forever, feeling the glory of our successes and pains of our losses forever, like a song stuck on repeat. When pressed, people often tell me that the final goal of the reincarnation process is to become “one with reality” in some way or to become a god themselves, thus gaining power over this reality sphere. What does becoming “one with reality” really mean? Does it mean that you gain an intrinsic awareness of all things, and perfect understanding? Is that something that you really want? This world isn’t such a great place. “But Tracey!” they cry. “Once you have the perfect understanding and awareness of all, you’ll see the Great Reason behind hatred and sickness and poverty! These things are just lessons!” Well, the proof is in the pudding, I say – and I don’t believe in punishing puppies for piddling on the rug. Despite this, my dogs are perfectly housetrained. Unfortunately, this doesn’t appear to be the guiding principle behind the lessons that we learn here on this earth. Suppose you were going to make a complaint to “upper management” about how this place was run – or you simply want a good explanation. How would you voice your concerns – and to whom, and with what authority? Not all complaints are made equal, after all. And once you had an idea of these things and the reasons behind them, how might you respond? Would you want to fix things, leave them as they are, or would you just want to get the heck out of here? Asking myself these kinds of questions made me decide that forming a relationship with the great gatekeeper of the cycle of reincarnation would be a logical step to finding these answers – or at least these answers for me – and so help guide my magical and spiritual trajectories. If I am stuck on this wheel of reincarnation for a time, then knowing well the hand that turns it seems like a good idea. This is the foundation of logic that supports my relationship with Santa Muerte. I want friendly and helpful assistance from Death, not a callous or destructive influence that would compound my problems. I am not claiming that Santa Muerte gave me the answers to all of these things; I am not some secret desert guru who gained her enlightenment beneath a Joshua tree. What I do claim is that Santa Muerte’s guidance has well-equipped me to find out these answers, which I consider to be aid and assistance of incalculable value. It is a common for Catholics to thank their saints by publishing a public declaration of thanks. If you’ve ever opened up the classified section of a newspaper and seen something like, “Thank you, Saint Jude, for your help – AB,” that is why that ad was placed. This book is the exact same sort of offering of thanks to Santa Muerte for guiding me on my way. These questions weren’t stupid at all; I rather enjoyed answering them. intuition shape the world around us. I have worked with Santa Muerte for many years now, a spirit whom many regard as a feminine form of Death. She is not terrifying or wicked, however. Our Lady of Death is a capable and helpful spirit in every regard. She responds fully and graciously to requests with unprecedented speed, which is why I am eager to bring my experiences with her to you. I believe that magic is a tool that can and should be used by everyone. I have developed my methods over the years with the newbie witch or magician in mind. My explanations are simple, friendly, and straightforward, taking the guesswork out of magic. Personally, I was born and raised with a Catholic upbringing in New Mexico. I still live and work there as a registered nurse, with years of emergency and trauma experience behind me. I share my home with my significant other and several large and very slobbery dogs. You can visit Tracy here.